Born Edinburgh qualified as a dentist and practised in Nottingham before moving to London in 1866. 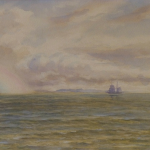 His style was influenced by David Cox and is similar to that of Claude Hayes, Thomas Collier and E.M Wimperis with whom he made regular painting expeditions around England. He was also a connoisseur and lecturer on English Watercolours.